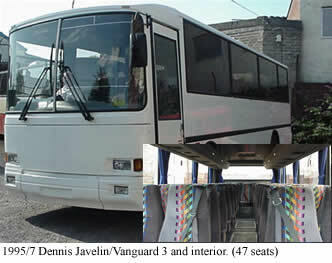 Our first venture into the coach sales business was to buy 180 left hand drive buses from the British Army in Germany. We sold a lot of the vehicles abroad but brought back about 70 twelve metre Leyland Tigers that we converted to right-hand drive. They can be seen in service all over the Bristol area, the south west and south Wales. The great assets of these vehicles were that they were really low mileage and very well maintained by the Army. 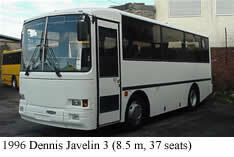 We still buy a lot of coaches from the Ministry of Defence but have moved on from Leylands to Dennis Javelins. We have 8.5 metre (37 seats), 10 metre (47 seats) and 12 metre (70 seats) available. Once again they are low mileage and have been well looked after. When you buy a MOD coach from us it will have been unregistered so we have to process each one and take it for its COIF (certificate of intitial fitness). Also it will have been resprayed and be in outstanding condition. Ex-Ministry of Defence vehicles that are well maintained and generally low mileage, i.e. less than 200,000 kms. They have a Cummins engine and a ZF gearbox that gives really good power and a smooth gear change. The 1992/93 model has a Wadham Stringer Vanguard 2 body, which has double rear doors, whereas the 1995/7 model has a Vanguard 3 body. They come with 47/48 high backed coach seats with 3 point seat belts; ABS brakes; curtains; Webasto heating; boot and side lockers; and forced air ventilation from luggage racks. 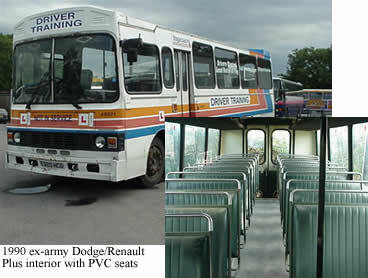 These are a particular favourite with PCV driving schools due to their easy handling characteristics. These coaches can have the number of seats increased to a maximum capacity of 60 using a 3 + 2 configuration across the body with new Cogent 3 point belted seats. Once again ex MOD vehicles with the same maintenance and mileage figures as the 10 metres coaches above. They are fitted with the same running gear as their larger cousins and are really popular on country lanes with tight corners. They have the same body specification including 37 high backed coach seats with 3 point belts. These coaches can have the number of seats increased to a maximum capacity of 45 using a 3 + 2 configuration across the body with new Cogent 3 point belted seats. 1987/90 Ex MOD vehicles that were made specifically for the army. They are based on the 12 ton, G12 Renault truck chassis with steel springs and a front mounted engine, which makes them ideal for use on rough roads. They have a Perkins T6 354.4 turbo diesel engine; Dodge 6 speed synchromesh gearbox; Wadham Stringer Commander body with 39 Pvc covered bus seats; power operated entry door; and double rear doors with fold down step. They also come with tinted windows, luggage racks with forced air blowers, side lockers and a rear boot. These buses are available in both left and right-hand drive models.